In December 2016, WITF, a public radio station in Harrisburg, PA, introduced a new podcast about food and recipes called Now That’s A Mouthful (NTAM), featuring, as hosts, local chef Donna Marie Desfor and WITF Smart Talk host Scott LaMar. The monthly test recipes would come from new cookbooks, usually three or more, with a selection of two to three recipes from each book. WITF listeners were encouraged to sign on as testers in January. The testers were to try the recipes and report back to the show with their feedback, whether good or bad. The only caveat from NTAM was that, if possible, excepting health reasons or the inability to find ingredients, the recipes were to be followed to the letter. Additionally, some testers would be selected to be guests on the podcast to discuss the recipe they tried. Being something of a foodie and modest amateur chef, I’m always looking for new recipes, so I signed on to be a tester. Then things took a turn for the worse. The cookbooks and recipes bordered on bizarre to eclectic, having ingredients I never heard of or could not find locally, or the directions were too complex. NTAM was the podcast equivalent of America’s Test Kitchen, and you know that their culinary arrogance knows no bounds. Amateur chefs and listening testers, like me, are not culinary geniuses like professional chef Donna Desfor. The recipes seemed more a condescending rebuff to kitchen novices everywhere. Sure I know stuff, like types of meats and vegetables, herbs and spices, and I can follow directions. But when things get weird and complicated, like strange ingredients and methods, I either bow out or hope the ubiquitous Internet might help me figure this stuff out. But the real problem why I couldn’t make 95% of the recipes is because of my wife’s food intolerance and allergies. Hence, we basically follow the Paleo diet to assuage her Candidiasis fungal problem. But, lo and behold, and finally, there comes a recipe that I might be able to try and my wife might be able to enjoy: Coconut Chicken Curry from Burma Superstar by Desmond Tan and Kate Leahy. But it had to be made Paleo. First, canola oil was out. Substitute extra virgin olive oil aka EVOO. Next, the fish sauce was gone. Have you seen what’s in commercial fish sauce? It’s nearly disgusting. I substituted coconut aminos the first time, but dropped them the second time. You can find substitute fish oil mixtures on the Internet, often using soy sauce as a base. But my wife can’t eat soy sauce. Good luck finding Madras curry in your local grocery store. On a road trip to three international grocery stores in Lancaster, I found some mild Madras curry powder at the Everest International Grocery store. But it was too mild. 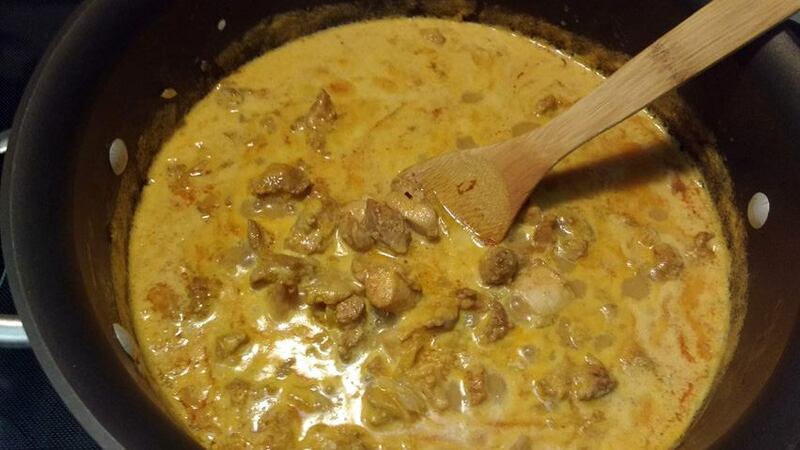 Instead, I substituted a better quality curry powder from a local grocery store, and then doubled it. I also doubled the cayenne pepper. You can bump it up more if you like things even hotter. The lime and lemon as a garnish was fine for me but, for my wife, it gets the heave ho. Finally, I streamlined the directions, taking out much of the unnecessary wordiness. So here you have it. A recipe from the Now That’s A Mouthful That that both my wife and I could enjoy, Burma Superstar’s Coconut Chicken Curry made Paleo. I think you might like it too. Combine the paprika, turmeric, and salt in a small bowl and set aside. Trim the chicken thighs of excess fat and cut into one-inch pieces. Transfer to a bowl and toss with spice. Allow the chicken to marinate in the seasonings for 1 hour (or more). In a large pot or Dutch oven, heat the EVOO over medium-high heat. Stir in the onions, and decrease the heat to medium-low. Cook for 10 minutes, stirring as needed to prevent the onions from browning. Add the chicken and stir into the onions. Pour in the coconut milk. Increase the heat to a near boil. Allow the coconut milk to thicken somewhat, about 4 minutes. (OPTIONAL) Decrease the heat to medium-low and add the coconut aminos. Stir in the water and bring the pot back to a near boil. Lower the heat to a simmer and cook, stirring occasionally, until the chicken is tender, about 50 minutes. Stir in the curry powder and cayenne, simmer briefly, and remove from the heat. Serve with bowls of cilantro, and lemon and lime wedges. Serve over riced cauliflower: food process the florets to small rice-like kernels, transfer to a microwaveable bowl, and then, before serving, microwave until heated through.